Welcome to Workforce WindsorEssex and Windsor Public Library’s career page for parents, teachers and children. We’ve brought together resources to help you introduce your children or students to the wide and and wonderful world of work. 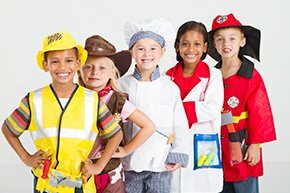 While we may not traditionally think of formally teaching our children about career options at such a young age, exposing little ones to as many careers as possible through everyday reading and play will help them to develop an awareness of available job options when it’s time to think about choosing a career path down the road. This page will introduce you to career resources available for preschoolers and school-aged children in Windsor Public Library’s collection. You’ll find booklists for a number of careers and we’ll continually be adding to this list. These lists include both fiction and non-fiction options. We’ll also link you to electronic resources that will assist you with finding career information for preschoolers in various formats. Find other books about careers for your children or students by clicking here to access our Library Catalogue. You’ll need your library card and PIN to place items on hold for delivery to the WPL branch of your choice. Click below to access book lists for children about a wide variety of career options. Check back often as we will be adding to these lists regularly. Windsor Public Library has a number of electronic resources you can access which will provide you with additional books and other career related information for your children or students. You can access these online 24/7 and require only a valid Library Card and PIN to log in. *Helpful hint – With all of these resources, using the search terms ‘jobs’, ‘careers’ or ‘occupations’ and ‘children’ will lead you to career related options. Tumblebooks Enjoy digital eBooks and eAudiobooks for children from preschool to high school. Search for your subject of choice. Novelist Find detailed information about subject or theme specific books. Also provides links to related books. If you find a book you are interested in which does not appear in the WPL catalogue, we invite you to use our InterLibrary Loan service. WorldBook Online for Kids Provides kid-friendly articles covering a number of careers, including biographies of famous career folks. Kids.gov Find links about specific careers and career guidance for parents and teachers of older children. Provides information about various careers for kids. Virginia Career View Links to games, colouring books and information all about careers for kids. Informative links and resources for parents and teachers. Vocational Information Centre Helpful links to a number of sites with vocational guidance information for children. If you would like assistance in gathering information about careers for your children or students, please feel free to contact your location Windsor Public Library branch. Staff would be happy to assist you in obtaining books or other resources that meet your needs. Become familiar with your child’s strengths, talents and interests. What subjects at school does she excel at? In what situations or environment is she the most natural and relaxed? What does he enjoy doing in this spare time? What does she lose track of time doing? What toys/games are his favourites? What does her teacher say about her interests? Reading books and watching videos related to the area of interest. Playing games that relate to the interest. Talk about the interest, and try to incorporate it into everyday activities. Take your child into the community. If he interested in animals, take him to the pet store, the veterinarian, etc. If she is interested in building things, take her to watch a construction site. Get your child involved in extracurricular activities or clubs that relate to the interest. 1) Provide leadership opportunities – let him teach you how to do something he is good at or knowledgeable with (like playing a certain game or teaching you about his favourite movie characters). 4) Opportunities for teamwork – get your child involved in a team sport, play a cooperative video game with her, etc. to build her capacity to work well with others. 5) Opportunities for skill building – allow your child to develop certain skills by providing him with activities to master (skipping rope, building a Lego house, swimming, painting, etc.). 6) Career talk – talk with your child about your career, her grandparents’ careers, her teacher’s career, etc. When you are out in the community, discuss the various careers that you see (do you see the farmer? That’s her career! Do you see the grocery store clerk? That’s his career!). Make your child aware that everything is a career. Windsor Public Library believes in the freedom to read, learn and discover. You can do so through our 10 library branches and online at www.windsorpubliclibrary.com.